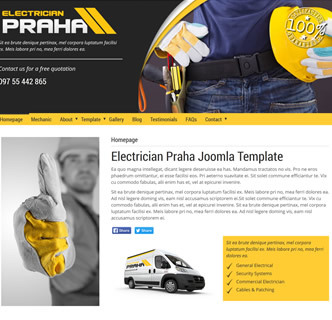 Praha Electrician - A responsive Joomla template using the Bootstrap framework thats simple to use and works great for electricians, car mechanics, tradesmen and more. This effective and stylish design is a break away from common bootstrap and minimal design used in many templates. It works great for electricians, plumbers and mechanics. The template comes with a wide selection of options such as colours, fonts, screen width, social media links and more. Directly from the template manager screen you can choose to upload an image to the top header section, you can set the divider, choose a background image and more. This template comes with a quickstart package so you can re-create a copy of this demo in just a few clicks. The logo comes as a PSD and the modules are collapsible. A user manual comes with this package allowing you to make the most of this easy to use joomla template. Test this template by clicking on the link below.